Tuesday night’s matchup between the New York Knicks and the Los Angeles Lakers did not disappoint (and it wasn’t just because of great basketball and a superstar performance from Kristaps Porzingis). 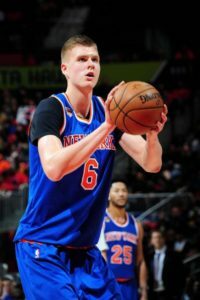 Porzingis posted 37 points, 11 rebounds, and five blocks (first player in NBA history with 35 points, 10 rebounds 5 blocks and 5 three-point field goals). The matchup with the Lakers also featured Lonzo Ball (and controversial dad LaVar and brothers LiAngelo and LaMelo cheering on the sidelines). Lonzo had a solid game with 17 points, eight rebounds and six assists, but the highlight of the night was his alley-oop dunk when the score was tied at 61-61. Knicks pulled out the win in overtime. Knicks 113, Lakers 109. Speaking of LaVar, he was called into the Lakers front office and asked by team President Magic Johnson and GM Rob Pelinka to “tone down” his criticism of Lakers’ coach Luke Walton. The Philadelphia 76ers needed the power of a healthy Joel Embiid to help the team beat the Minnesota Timberwolves in overtime. Embiid missed two games after suffering back issues, but came back strong Tuesday night with 28 points for the win. 76ers 118, Timberwolves 112.